Former police Lt. Michael Lohman admitted helping to cover up police shootings after Hurricane Katrina. New Orleans, Louisiana (CNN) -- A former New Orleans police lieutenant pleaded guilty Wednesday to obstruction of justice in connection with the police shootings of civilians in the days after Hurricane Katrina and court documents unsealed with the plea suggest that other officers will be indicted in the case. Former Lt. Michael Lohman was convicted of "conspiring with a group of New Orleans police officers to obstruct justice by engaging in a cover-up of the true circumstances surrounding the shooting, by NOPD officers, of a number of individuals," U.S. Attorney Jim Letten of the Eastern District of Louisiana said at a news conference. Two civilians were killed and four were wounded in the shootings on the Danziger Bridge on September 4, 2005, days after Hurricane Katrina roared ashore on the Gulf Coast. 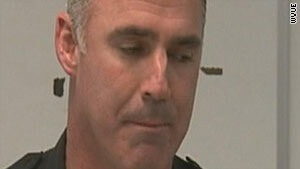 The guilty plea does not signal the end of the investigation into the incident, Letten said. "Know this: the investigation continues," he said, adding that "this investigation is being conducted very aggressively, but also very fairly." The federal indictment unsealed Wednesday signaled that other indictments are likely. "[T]he incident involved at least seven NOPD officers who drove to the Danziger Bridge in a rental truck in response to a call for police assistance," the indictment said. CNN New Orleans affiliate WVUE reported that two other officers have received target letters from federal prosecutors. Such letters are sent to targets of grand jury investigations. Legal scholars said they expected more indictments in the cover-up of the shooting but that it's unclear whether any officers will be charged for the shooting itself. "There's no evidence the officers shot out of malice," said Dane Ciolino, a professor at Loyola University New Orleans' College of Law. "It was probably negligence, ratcheted up to a federal offense by the cover-up." Lohman, the officer who pleaded guilty Wednesday, conspired with other police officers to cover up the shootings even though he believed them to be "legally unjustified," according to the federal indictment. Among Lohman's actions, he fabricated stories, statements, a 17-page report and a follow-up report, and lied to federal agents, Letten said. The shootings occurred after several officers, responding to a call for assistance, drove to the bridge and encountered six civilians who were walking across it to get food and supplies, the indictment says. The officers fired, killing one person -- later identified as 19-year-old James Brissette -- and wounding four others, according to the indictment. Once they reached the other side of the bridge, the officers started shooting again, killing Ronald Madison, a 40-year-old severely disabled man, the indictment says. Madison was shot seven times -- five times in the back, the coroner has said. Lohman arrived on the scene after the shooting, learned that his police colleagues "planned to provide false stories about what had precipitated the shooting" and "encouraged them to do so," according to the indictment. Among other things, Lohman did not ensure police collected evidence, suggested that colleagues get rid of some shell casings the shooters had left behind and went along with a plan to plant a gun near the bridge, according to the indictment. The officers falsely arrested Madison's brother on eight counts of attempted murder of a police officer, according to the indictment. Lance Madison was held for weeks before being released without any formal charges filed against him. State prosecutors pursued criminal charges against several police officers without success. In August 2008, a judge quashed indictments against Sgts. Kenneth Bowen and Robert Gisevius Jr., Officer Anthony Villavaso II and former Officer Robert Faulcon Jr., all of whom were facing first-degree murder and attempted murder charges. In addition, he threw out attempted first-degree murder charges against Officers Mike Hunter Jr. and Robert Barrios, and attempted second-degree murder charges against Officer Ignatius Hills. Federal prosecutors opened an investigation after the judge's actions. The failure of the state prosecutors' strategy is another reason legal scholars say they expect the federal indictments to hinge on the cover-up instead of the shooting itself.